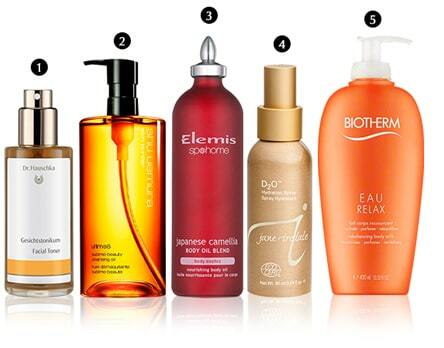 The secret to looking always polished starts gentle products that won't irritate sensitive skin. For a makeup-clearing cleanser that won't leave your skin feeling sucked dry, try 2 Shu Uemura Ultime 8 Sublime Beauty Cleansing Oil 450ml ($936.00). Next, follow up with the all-natural 1 Dr. Hauschka Facial Toner , which tightens pores and keeps moisture locked in for naturally plump, baby-soft skin. For the rest of the day, keep a bottle of 4 Jane Iredale D2O Hydration Spray ($196.00) on hand to mist over your face whenever you need a pick-me-up. This ultra-gentle formula is regulates your skin's pH level and keeps your skin from drying out throughout your daily engagements. But don't leave out the rest of your body. Gentle moisturizing oils like 3 Elemis Japanese Camellia Oil ($341.00) and 5 Biotherm Eau Relax Rebalancing Body Milk can be used all over the body and yes - even the face - to achieve uniformly hydrated skin. Known for her natural look, Meghan Markle likes to let the beauty of her skin shine through rather than concealing it under a layer of makeup. She even prefers to let her signature freckles stay visible, which is why she only wears barely-there tinted moisturizers. You can get a similar look with 4 Bareminerals Complexion Rescue Tinted Hydrating Gel Cream SPF30 ($251.00) or 3 Laura Mercier Foundation Primer ($329.00). Using the same philosophy for your lips, use 5 Fresh Sugar Lip Treatment SPF 15 ($282.00) for a semi-translucent wash of colour. Next, give your eyes that bright, wide-awake look by applying 7 Yves Saint Laurent Radiant Touch/ Touche Eclat ($301.50) to your under-eye area. Looking for luscious lashes? 1 Revitalash Eyelash Conditioner ($846.00) is reportedly Meghan Markle's favourite way of getting even more mileage out of her gorgeous eyes. With a generous application of 2 Christian Dior Diorshow Iconic Overcurl Mascara ($227.50) on top, you'll be the talk of the town. Finish with a light dusting of 6 Make Up For Ever Ultra HD Microfinishing Pressed Powder for a totally silky, photo-filtered look. Meghan's style icon moments are always defined by perfectly-styled hair. The product she allegedly swears by is 1 Kerastase Nutritive Oleo-Relax Smoothing Mask 500ml , which instantly turns rebellious hair into sumptuous locks. If your hair is merely dry or tangled, 2 L'Oreal Professionnel Mythic Oil ($219.50) is your best bet for adding shine and sleekness. Next, manage unruly locks with 4 Moroccanoil Smoothing Lotion ($317.50) or 5 Kevin.Murphy Smooth.Again Anti-Frizz Treatment 200ml to banish frizz for the remainder of the day. 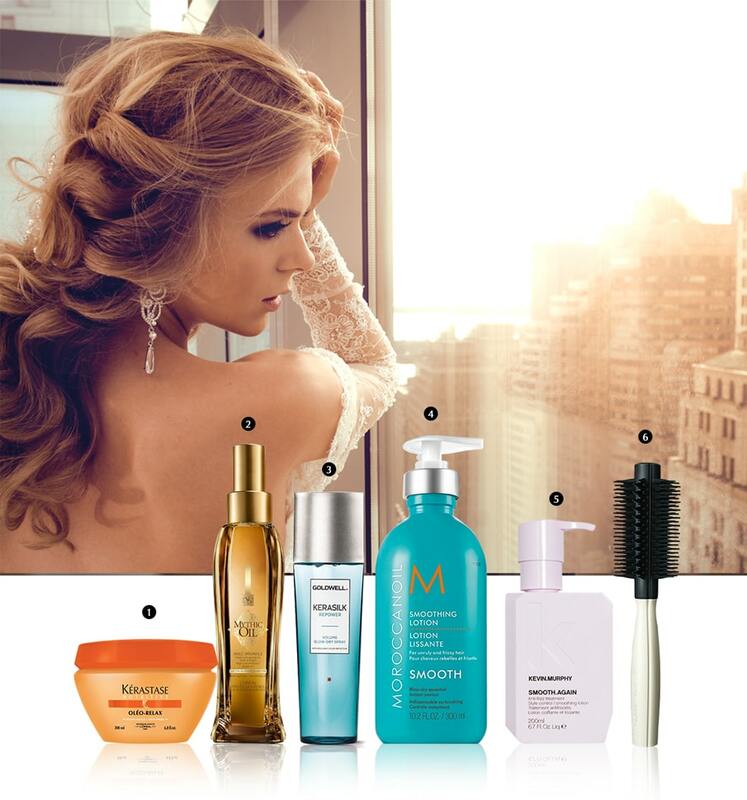 These styling products are totally weightless and make your hair sleeker than a runway model's. When you're ready to add some glorious curls, prep your hair with 3 Goldwell Kerasilk Repower Volume Plumping Cream ($192.00) to get that extra bit of bounce. Then use 6 Tangle Teezer Blow-Styling Round Tool - # Large ($207.50) to achieve a duchess-worthy blowout.